That name: Unique Bella, the Eclipse Award-winning 4-year-old filly trained by Hall of Famer Jerry Hollendorfer, owned by Don Alberto Stable and earner of more than $1.2 million from nine wins in 12 career starts, most recently a half-length score in the Grade I $300,000 Clement L. Hirsch Stakes here on July 29. Hollendorfer also nominated Full of Luck, a five-year-old son of Lookin At Lucky of which he is a part owner. Full of Luck was imported late last year after two standout seasons in Chile and produced his best result in four U.S. starts when third in the Grade III $100,000 Cougar II Handicap here on July 25. Other horses, beside the Hollendorfer duo, whose nominations were received Thursday morning were: Accelerate, Ann Arbor Eddie, Catalina Cruiser, Pavel, Prime Attraction and The Lieutenant. The deadline for nominations, at a cost of $300, is midnight Thursday. Supplemental entries, at a fee of $10,000, can be received up until the field is finally set next Tuesday. For Unique Bella to take on males would be a departure from the norm for Hollendorfer. He resisted temptation to do so on several occasions with champion filly Songbird throughout a 15-race career in which she won 13 of 15 starts and earned more than $4.6 million before being sold at auction as a broodmare prospect for $9.6 million. Hollendorfer was dismissive of calls early last year to run Unique Bella in the Kentucky Derby rather than the Kentucky Oaks, before the disscussions became moot when an injury sidelined her for four months. Hollendorfer has four previous Pacific Classic starters and won the 2014 running with Shared Belief. There have been five females to run in the Classic starting with Paseana (5th, 1992) and most recently with Beholder. The Richard Mandella-trained champion went from winning the Clement L. Hirsch to victory in the Pacific Classic in 2015 and finished second to California Chrome the following year. The 1 ¼-mile TVG Pacific Classic, signature event of the summer season, will have its 28th running on Saturday, August 18. San Diego Handicap winner Catalina Cruiser is scheduled to have a final workout Friday morning in preparation for a possible Pacific Classic start. Juan Leyva, assistant trainer to John Sadler, is expected to be aboard the unbeaten (3-for-3) son of Union Rags in his second serious exercise since a dominating, wire-to-wire, 6 3/4 –length romp in the San Diego. Likely Pacific Classic favorite Accelerate, winner of the Santa Anita Handicap and the Gold Cup at Santa Anita, is scheduled to have his final work for the Pacific Classic on Sunday. Sadler doesn’t relish the idea of running both Accelerate and Catalina Cruiser, and has expressed preference for Accelerate in the race, but will delay any decision until after the final works and near Tuesday’s close of entries. Bob Baffert has Dr Dorr and Mubtaahij as possibles in quest of a sixth Classic victory that would tie Bobby Frankel for most by a trainer. Friday morning, Baffert plans to work newly-acquired Roman Rosso, an Argentine-bred multi Group I winner in South America. “He might run in the Classic or the (Harry F.) Brubaker,” Baffert said via text. Mark Glatt said a decision on whether to nominate Sharp Samurai for the Classic would be made after discussions with owners Red Baron’s Barn LLC and Rancho Temescal later Thursday. Leonard Powell said Cougar II Handicap winner Beach View would likely be nominated to the Pacific Classic and another stakes on the card the same day. Also closing nominations at midnight Thursday are the Grade II $250,000 Del Mar Handicap by the Japan Racing Association, the Grade I $300,000 Del Mar Oaks presented by the Jockey Club and the Grade II $200,000 Del Mar Mile. “Just looking at the (Classic) probables, there’s a good chance I’m going to go in because it doesn’t look like a vintage edition,” Powell said. Instagrand, a $1.2 million purchase at the Fasig-Tipton sale in March, who looked well worth it in a 10-length debut victory at Los Alamitos on June 29, was established as the 1-2 favorite against five rivals for Saturday’s featured Grade II $200,000 Best Pal Stakes. Raced at 6 ½ furlongs from 1993-2017, the event that serves as a prep for the Grade I $300,000 Del Mar Futurity on September 3, has been cut back to six furlongs for its 48th running. That would seem to be a nice stretch-out distance for Instagrand, a son of Into Mischief owned by OXO Equine LLC, whose impressive debut was at five furlongs. “He been doing great,” Hall of Fame trainer Jerry Hollendorfer said. “He’s improved in all of his works and now he’s going to run against good colts in a big race here. The field from the rail: Instagrand (Drayden Van Dyke, 1-2), Owning (Mario Gutierrez, 5-2), Synthesis (Kent Desormeaux, 15-1), Mason Dixon (Flavien Prat, 5-1), Sparky Ville (Gary Stevens, 10-1). 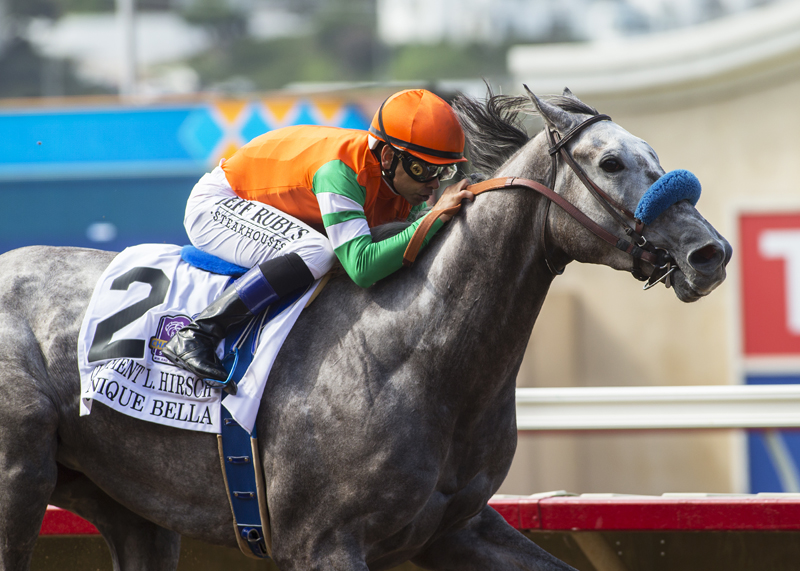 Bill Spawr-trained Skye Diamonds will face five rivals defending her title in Sunday’s $100,000 Grade III Rancho Bernardo Handicap for older fillies and mares at 6 ½ furlongs. Skye Diamonds was a 1 ¼-length winner a year ago as the 5-year-old daughter of First Dude won three of four stakes assignments, two of them graded, in a six-month stretch. Skye Diamonds is 0-for-5 since, all in stakes company. The post position draw was scheduled later Thursday. The entrants, in alphabetical order: Anonymity (Flavien Prat), Deer Valley (Drayden Van Dyke), Moonshine Memories (Mike Smith), Skye Diamonds (Tiago Pereira), Turkish Tabby (Mario Gutierrez) and Yuvetski (Tyler Baze). Apprentice jockey Assael Espinoza was awarded a stay of the 10-day suspension handed down by stewards for causing an incident in which jockeys Corey Nakatani and Geovanni Franco were injured in Saturday’s final race, according to agent Brian Beach. The decision, handed down by judge Timothy M. Casserly in San Diego County Superior Court, means that the suspension will be on hold until an appeal can be heard at a later date. Trainer Mike Machowsky and handicapper Rob Henie will be the guests providing opinions and selections at the upcoming weekend handicapping seminars. Machowsky has six Del Mar stakes victories, most notably the 2011 Del Mar Mile with Caracortado. Henie, whose daily selections are found on the West Coast Handicapping Report and are often featured on John Cherwa’s Los Angeles Times racing website, will be Frank Scatoni’s guest on Sunday. The seminars are held from 12:45-1:30 p.m. at the Seaside Terrace near the head of the stretch. Saturday will also be another Donuts Day at Del Mar with free juice, coffee and donuts and a question and answer session for fans hosted by announcer Trevor Denman and featuring trainers John Sadler, John Sherriffs and Del Mar Thoroughbred Club Vice President of Racing Tom Robbins.